5366 ∆ 44II/IV 3 Mk. On 7 ½ Pfg. 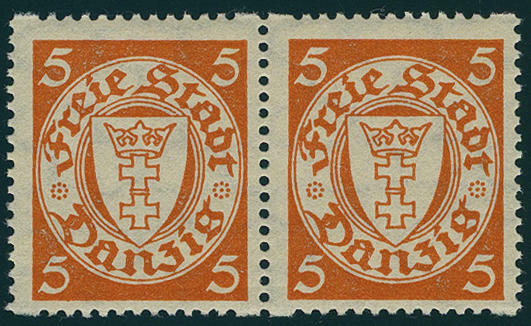 Red orange with rare variety \"double burelage, tips downward\", fresh colors and in perfect condition on wonderful white letter piece, all perfect on self-formed pages \"Gdansk LANGFUHR 29.2.21. \". 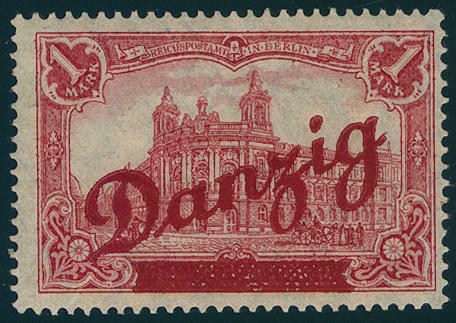 In this kind a major rarity from Gdansk for your highest requirements. In the Michel special catalogue due to missing offers only noted without price. Photo expertize \"genuine and immaculate\" Tworek BPP. 5367 ⊙ 45III 5 Mk. On 2 Pfg. 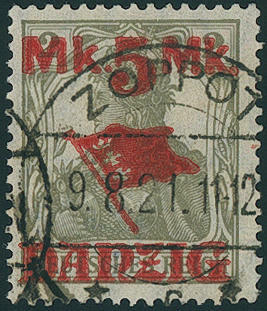 Without background, fresh colors and very well perforated, clean on self-formed pages \"Sopot 9.8.21\" in perfect condition. There are only few genuine used examples from this known. 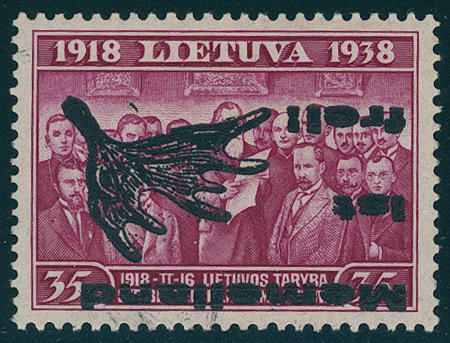 These to class among the rarities from Gdansk. Photo expertize \"the condition is perfect\" Dr. Oechsner BPP. 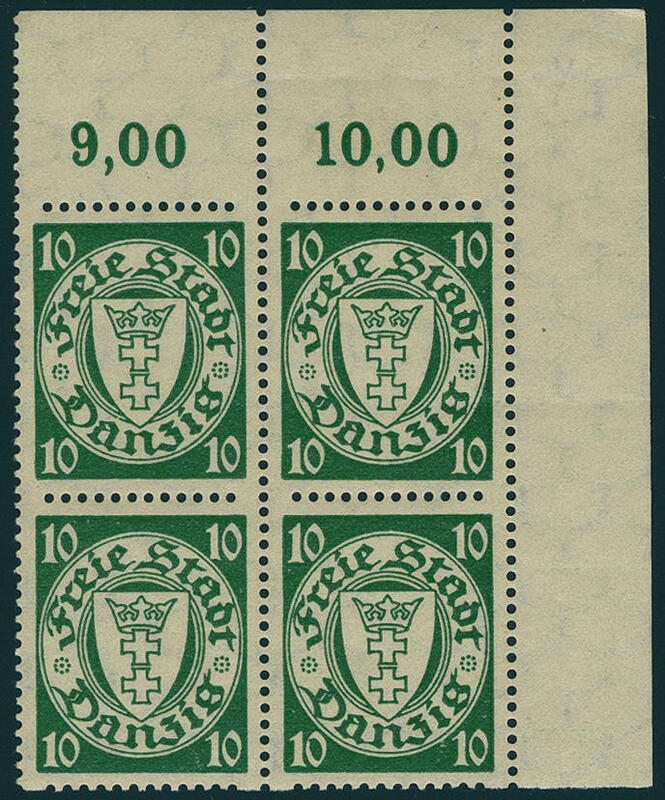 5368 47/49 Large indoor service 1920, all three values fresh colors and very well perforated, in perfect condition mint never hinged a particularly beautiful set of this issue for the highest standards! Photo expertize \"genuine and immaculate\" Soecknick BPP. 5369 47/49 Large indoor service 1920, all three values wonderful fresh colors and very well perforated, in perfect condition unused with original gumming. 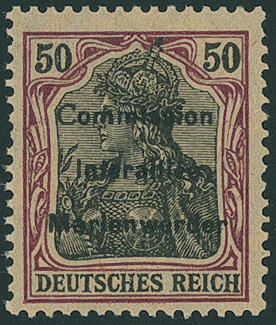 A very nice set this sought-after and rarely issue! Photo expertize \"genuine and IN perfect quality\" Gruber BPP. 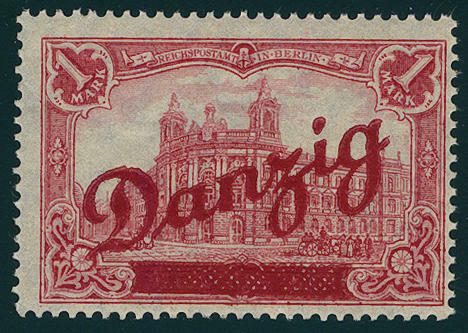 5370 ∆ 47/49 Large indoor service 1920, all three values wonderful fresh colors and very well perforated, clean on self-formed pages \"Gdansk 15.12.20. 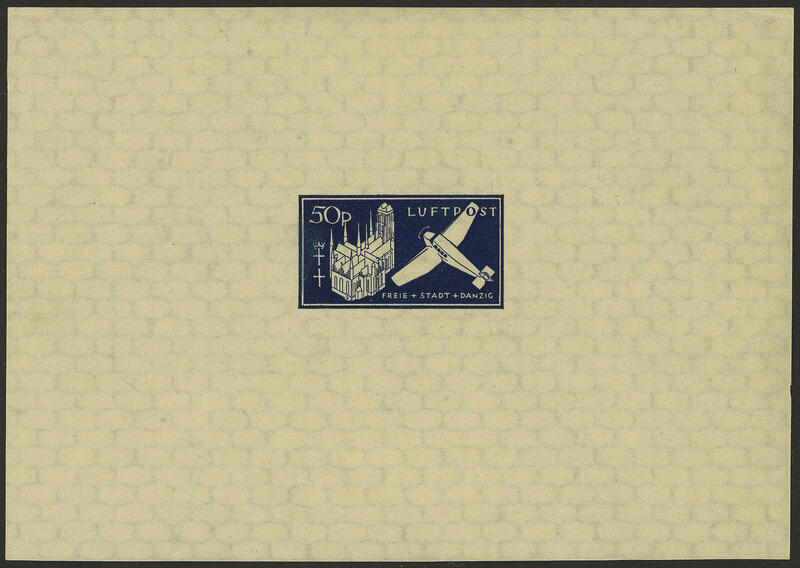 \" respectively \"Sopot 3.9.20. Respectively 4.9.20\". 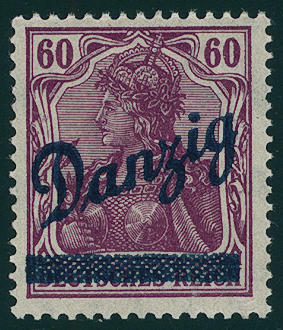 Date-appropriate related sets of this issue to class among the large rarities from Gdansk and are offered infrequently. A rare nice set in perfect quality. 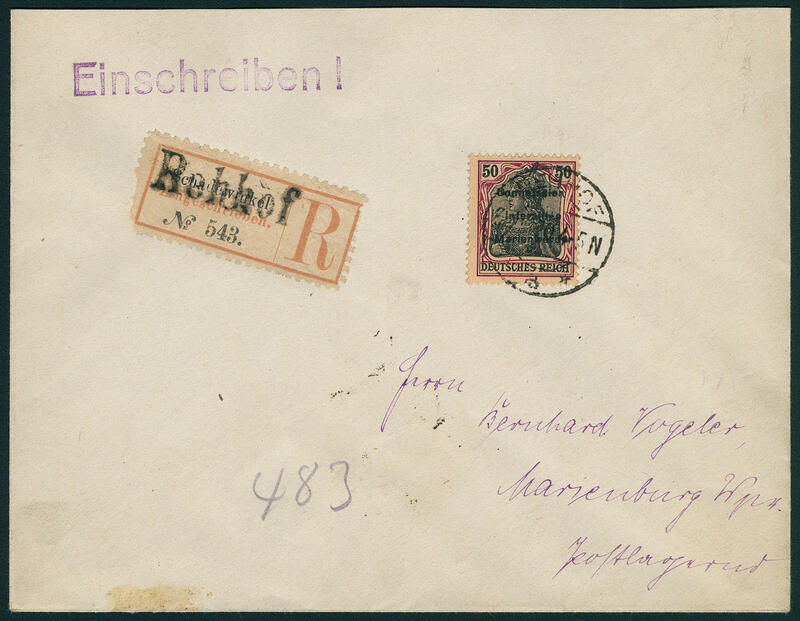 Three photo certificates \"the condition is perfect\" Dr. Oechsner BPP respectively Gruber BPP. 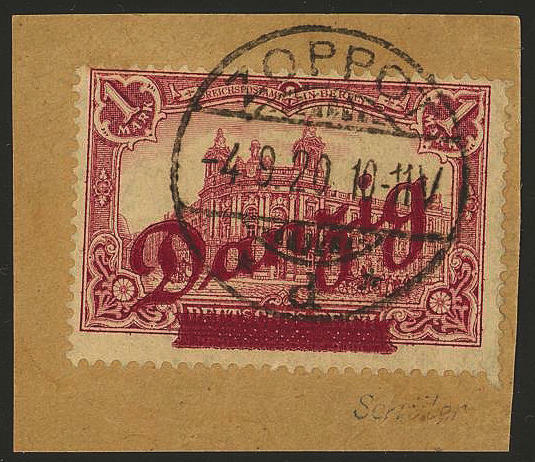 5371 ∆ 47I,48/49 Large indoor service 1920, all three values wonderful fresh colors and very well perforated on lovely letter pieces with perfect CTO \"Sopot 7.9.20. \". As well the 60 Pfg. 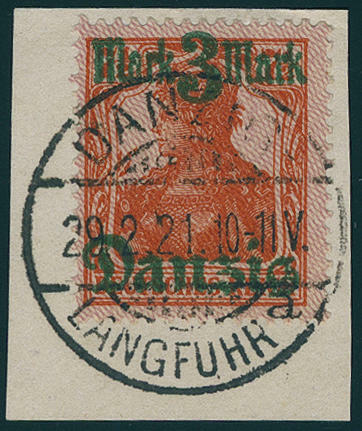 With scarce overprint error \"overprint bar vertical divided\" which only on the plate 1 on field 43 occurs. 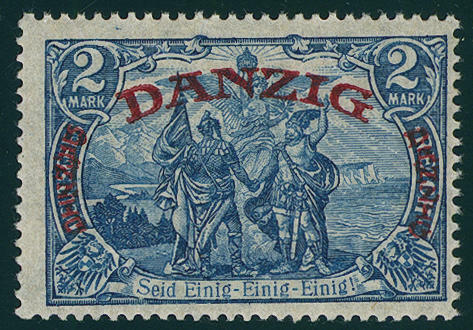 A particularly beautiful lovers series of this rare issue! Current photo certificates \"genuine and IN perfect quality\" Gruber BPP. 5372 180FUDD 50000 Mk. 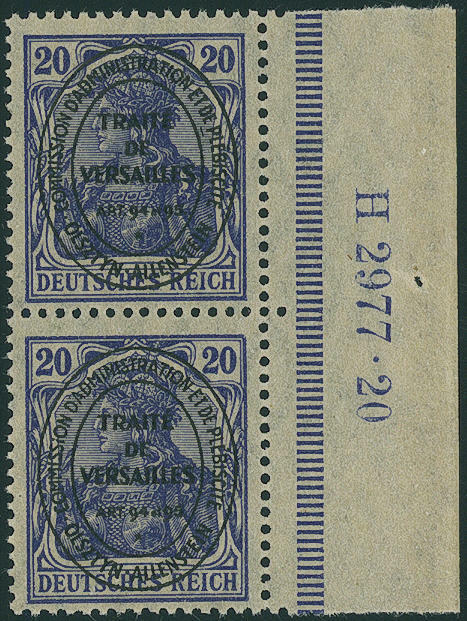 Airmail without overprint of the new value, unperforated with strong displaced double impression from of the right upper corner of the sheet, in perfect condition mint never hinged very decorative and scarce variety, in this kind in the Michel special catalogue unlisted. Photo expertize Dr. Oechsner BPP. 5373 193/94Dy 5 Pfg. And 10 Pfg. 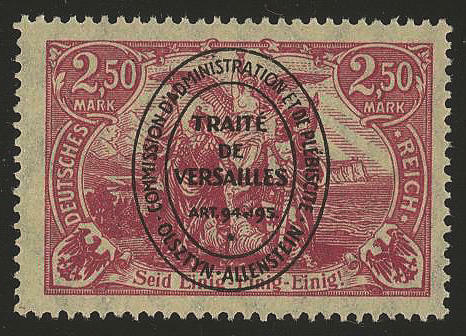 Coat of arms with coil perforation, paper dull chrome yellow, both values in blocks of four from upper margin respectively corner margin top right, fresh colors and in perfect condition mint never hinged, rare, photo expertize respectively photo expertize \"genuine and immaculate\" Soecknick BPP. Michel 900,- €. 5374 193Dy 5 Pfg. 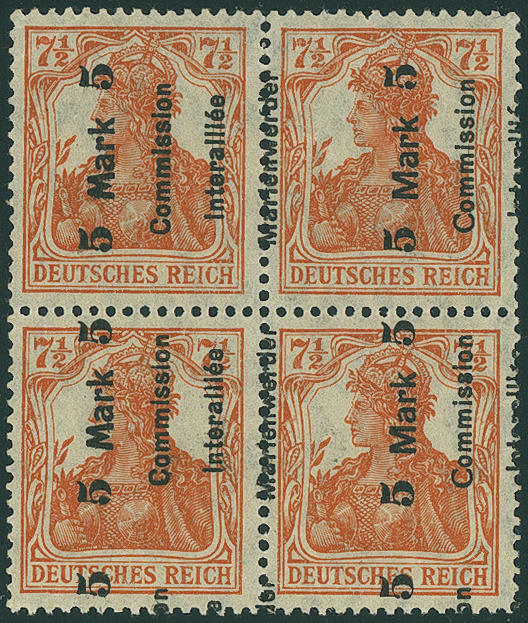 Red orange on dull chrome yellow, horizontal pair with coil perforation, unfolded, in perfect condition mint never hinged, without any signs. Photo expertize \"genuine and immaculate\" Gruber BPP. 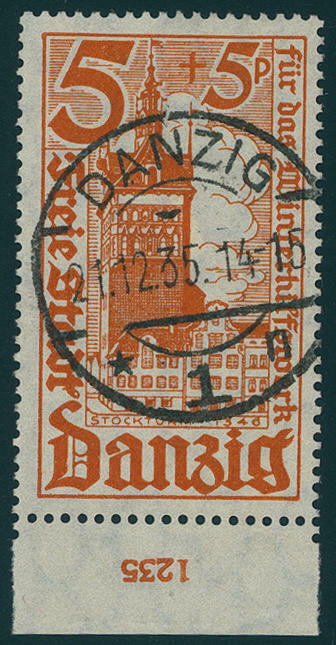 5375 ⊙/∆ 256/58HAN Winter help work 1935 from margin of sheet with house order numbers \"1135 respectively 1235\", 10 Pfg. 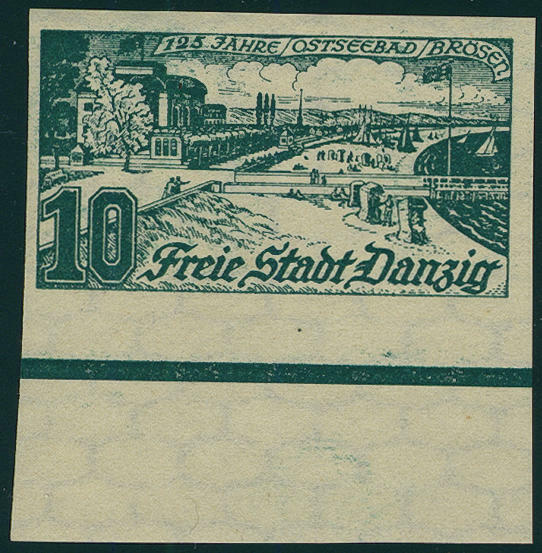 A little separated, clean on self-formed pages \"Gdansk\", photo expertize Gruber BPP. 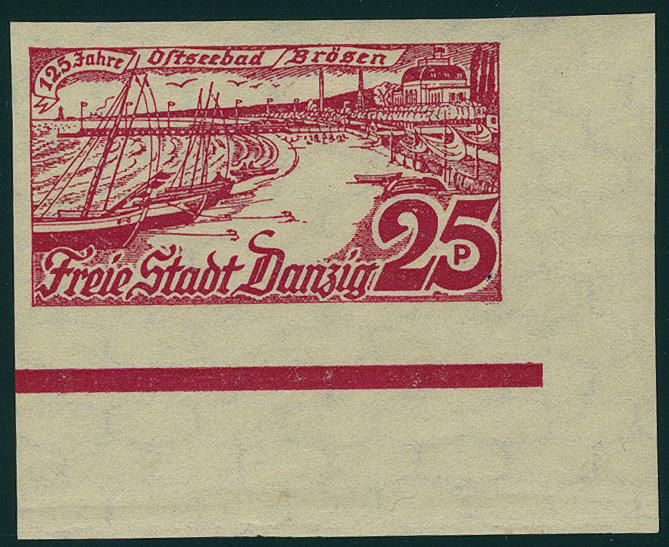 5376 259/61U Baltic Sea resort Brösen 1936 four sides unperforated from margin of sheet respectively corner margin, fresh colors and in perfect condition mint never hinged, without any signs. A scarce set! 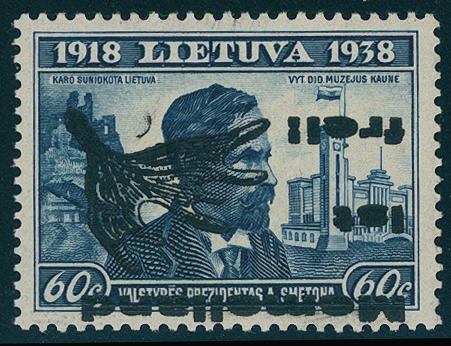 5377 Bl.2BPU Daposta 1937, airmail souvenir sheet in black blue, spectacular proof without edge lettering unperforated, a minimal edge split right and a tiny color gradient in the left design of the stamp are absolutely meaningless. This is a the all large rarities of this area. 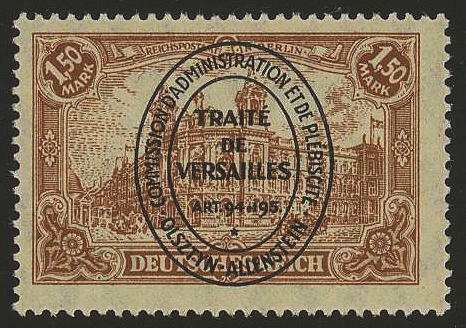 Also in the Michel special catalogue unlisted and from utmost rarity! Photo certificates Erdwien BPP, Gruber BPP. 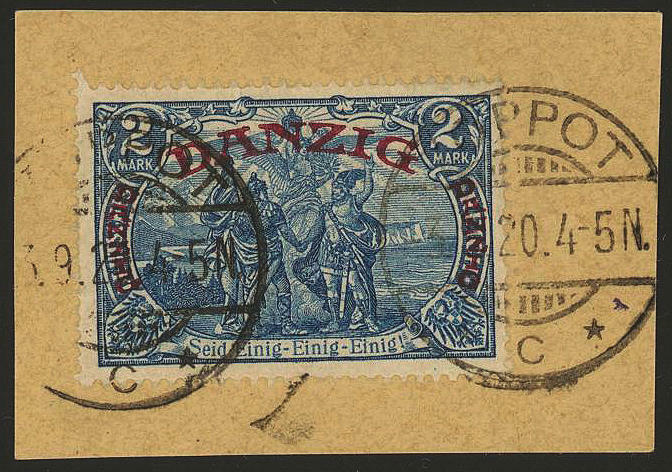 5345 Jan 28 Postal stamps 1920, both sets, in perfect condition mint never hinged Michel 155,- €. 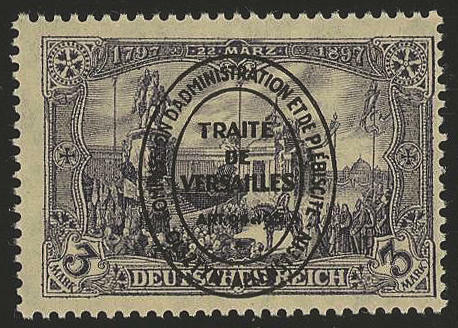 5346 19a 20 Pfg. 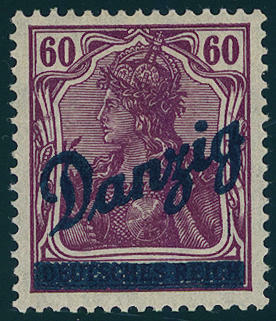 Lilac ultramarine, fresh colors and in perfect condition mint never hinged, expertized Hey BPP. Michel 350,- €. 5347 19aHAN 20 Pfg. 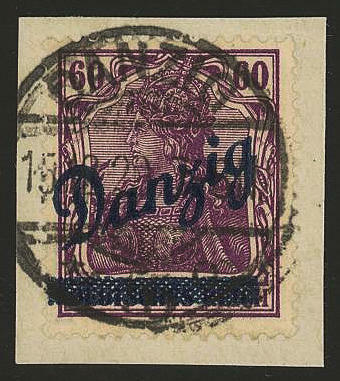 Lilac ultramarine, vertical pair from right margin with house order number \"H2977.20\", fresh colors and very well perforated, unfolded, in perfect condition mint never hinged the scarce colour places in this kind a rarity of this area dar, expertized Hey BPP. 5348 ✉ 17x 50 Pfg. 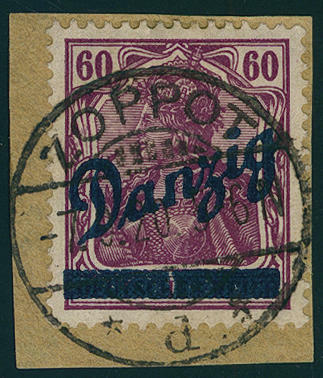 Dark gray purple / black on medium chrome yellow, having bright colors and excellent perforated outstanding quality as scarce correctly franked single franking on registered cover from \"Deer yard 3.5.20. 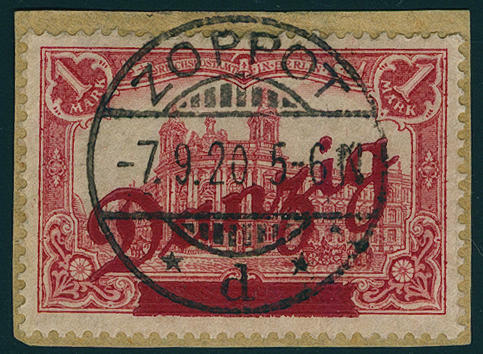 \" with provisional registration label to Marienburg / West Prussia. A rarity of this area. 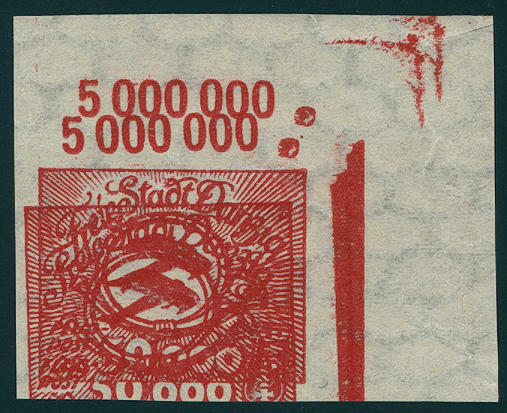 There are only few correctly franked single frankings have become known! Photo expertize \"excellent condition and perfect\" Prof. Dr. Klein BPP. 5349 17xHAN 50 Pfg. 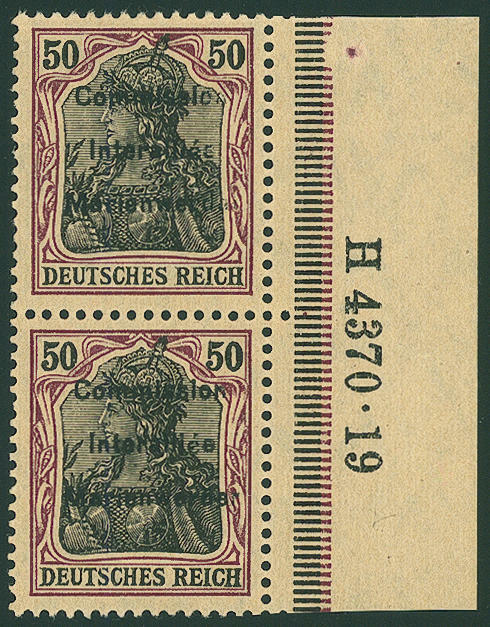 Germania on pale chrome yellow paper, vertical pair from right margin of sheet with house order number \"H4370.19\", fresh colors and in perfect condition mint never hinged a spectacular rarity of this area in excellent quality! Photo expertize Prof. Dr. Small. 5350 17y 50 Pfg. 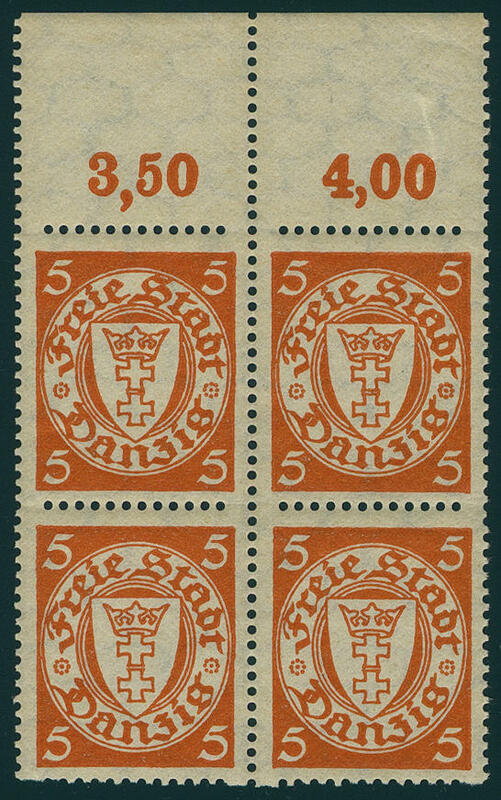 Dark gray purple on orange white paper, wonderful fresh colors and in perfect condition mint never hinged, without any signs. 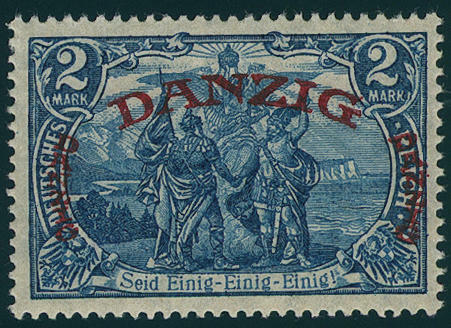 In mint never hinged condition are only a few examples from this known! Photo expertize buck BPP. 5351 / 25Abart 5 Mk. 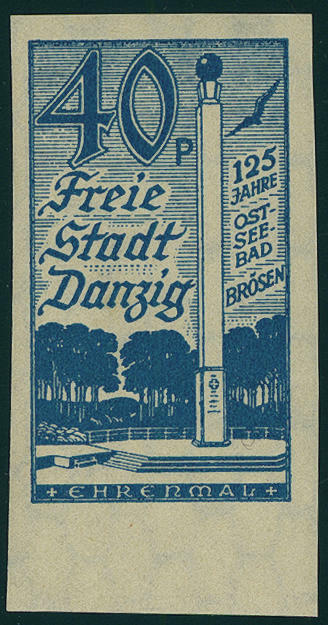 On 7 ½ Pfg. 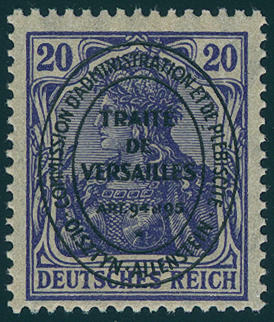 Germania, block of four with vertical in lieu of horizontal overprint, perforation vertical slightly prefolded, mostly mint never hinged, a very decorative and extremely scarce variety. In this kind a Honor for the advanced special collection! Photo expertize Prof. Dr. Small. 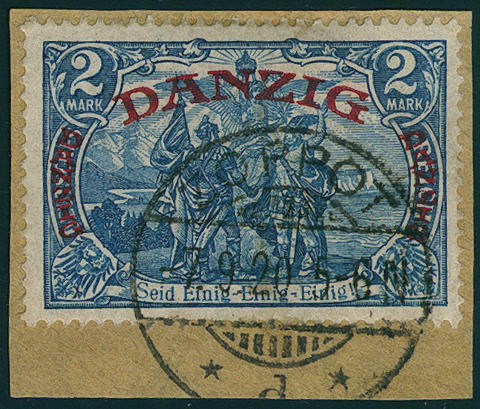 5391 I/IVK Local issue 1939, all fours values with inverted overprint, fresh colors and in perfect condition mint never hinged complete sets of this variety are very rare! Photo expertize Dr. Klein BPP. Michel 1600,- €.